I had a root canal today. The procedure took two. freaking. hours. So I’ve been sleeping off the numbness on the left side of my face for the past few hours, ergo, no Try it Tuesday. I DO have something for you for tomorrow, though, so buck up! But for the rest of the evening, I’ll be drinking my meals and holding an ice pack on my cheek. Sadly, they did not give me laughing gas to go. Let’s see when I go for the dental implants in Aurora next time. Womp, womp. There are few things in the world I truly hate. The list is fairly small: poor grammar, people that wear a blue tooth in other places besides a boardroom (you’re in the GROCERY STORE, you’re not trading stocks! ), and the fact that Moore has FOUR chicken tender/wing/nugget places next to each other within a 3-mile radius. 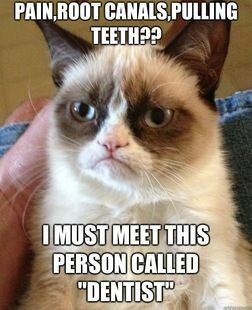 But the thing I loathe with the fire of a thousand suns is: THE DENTIST. He’s pure evil, GC. You’ll love him. Although, now that I’ve pushed a baby out of a very intimate area, going to the dentist seems like a cake walk. Which brings me to today’s “thankful for” post. Today I am thankful for: Nitrous Oxide. That’s some strong stuff, Doc. Ever since I was little, I have hated going to the dentist. I even bit my dentist in Hamilton once (which later led to an altercation between he and my father; don’t worry, no fists were flung) and since then I have never liked going to the dentist. True, its probably because at one point I had 13 cavities (what, you mean brushing with Jack doesn’t kill bacteria? Ke$ha lied!) and every time I saw the dentist they made my gums bleed. Now, however, I actually enjoy going to the dentist. Mostly because they give me the laughing gas and its like I’m on a mini-vacation, but still! It works for me and it gets my teeth clean. And not only that, but the dentist I go to now has Netflix. Three of my favorite things: a comfortable chair that reclines, mild sedatives, and television on demand. Can’t. Beat. That.